The Birds of America is a book by naturalist and painter John James Audubon, containing illustrations of a wide variety of birds of the United States. It was first published as a series in sections between 1827 and 1838, in Edinburgh and London. Not all of the specimens illustrated in the work were collected by Audubon himself, some were sent to him by John Kirk Townsend who had collected them on Nathaniel Jarvis Wyeth's 1834 expedition with Thomas Nuttall. The work consists of 435 hand-coloured, life-size prints, made from engraved plates, measuring around 39 by 26 inches (99 by 66 cm). It includes images of six now-extinct birds: Carolina parakeet, passenger pigeon, Labrador duck, great auk, Eskimo curlew, and pinnated grouse. Art historians describe the quality of Audubon's work as being of high quality and printed with "artistic finesse." The plant-life backgrounds of some 50 of the bird studies were painted by Audubon's assistant Joseph Mason but he is not credited for his work in the book. He shot many specimen birds as well as transporting and maintaining supplies for Audubon. Audubon also authored the companion book Ornithological Biographies. Plate 1 by John James Audubon depicting a wild turkey, (Meleagris gallopavo). About 1820, around the age of 35, Audubon declared his intention to paint every bird in North America. In his bird art, he mainly forsook oil paint, the medium of serious artists of the day, in favour of watercolours and pastel crayons (and occasionally pencil, charcoal, chalk, gouache, and pen and ink). As early as 1807, he developed a method of using wires and threads to hold dead birds in lifelike poses while he drew them. In 1823, Audubon went to Philadelphia and New York, looking for financial support using subscriptions to enable him to publish his artwork. He sold the copper engraving plates through on a subscription basis in North America and Europe. Those subscribed obtained five plates at a time. Each subscriber received prints of three smaller birds, a larger bird and a mid-sized bird. The prints were produced from 1827 to 1838 that cost each subscriber around $1,000. It is thought that no more than 120 complete sets exist today. Each set consists of 435 individual plates that are based upon the original paintings. Each plate was engraved, printed, and hand colored by Robert Havell of London. While William Lizars, of Edinburgh, engraved the first ten plates, Havell actually finished some of those. Audubon often found support lacking. As a result, in 1826, he set sail for the United Kingdom with 250 of his original illustrations, looking for the financial support of subscribers and the technical abilities of engravers and printers. After exhibiting his drawings in Liverpool and Manchester, he journeyed to Edinburgh, where he met the accomplished engraver William H. Lizars. Lizars engraved up to ten of the first plates but was unable to continue the project when his colourists went on strike. In 1827, Audubon engaged the noted London animal engraver Robert Havell Jr., and his father, Robert Havell Sr. Havell Jr. oversaw the project through to its completion in 1838. Zenaida macroura (now called mourning dove). The original edition of The Birds of America (sometimes called the Havell Edition after its printer, and sometimes called the "Double Elephant Folio", because of its size) was printed on handmade paper 39.5 inches tall by 28.5 inches wide. The principal printing technique was copperplate etching, but engraving and aquatint were also used. Colorists applied each color in assembly-line fashion (over fifty were hired for the work). Audubon funded the costly printing project through a pay-as-you-go subscription. From 1826 to 1829, he travelled around the UK and to Paris, lecturing on ornithology and frontier American life in an effort to entice wealthy patrons to subscribe to the series of prints. Subscribers included the French king Charles X, the British queen Adelaide of Saxe-Meiningen, Lord Spencer, and, later, the Americans Daniel Webster and Henry Clay. Prints were issued in sets of five every month or two in tin cases and each set usually included one very large bird, one medium-sized bird, and three small birds. The plates were published unbound and without any text to avoid having to furnish free copies to the public libraries in England. It is estimated that not more than 200 complete sets were ever compiled. An accompanying text, issued separately, was written by Audubon and the Scottish naturalist and ornithologist William MacGillivray and published in five volumes in Edinburgh between 1831 and 1839, under the title Ornithological Biography, or, An account of the habits of the birds of the United States of America. The additional cost of the five volumes of text brought the total cost of plates and text to about $1000. After the folio edition was completed, Audubon decided to produce a more affordable edition and employed a lithographer from Philadelphia named J. T. Bowen. Bowen and his team created a smaller Royal Octavo edition, which was issued to subscribers in seven volumes and completed in 1844. Five more octavo editions were completed through 1877. The octavo edition used the text of the Ornithological biography but increased the number of plates to 500, separating some birds which had originally appeared together. Some new drawings were included, mostly by John Woodhouse though Audubon and members of Bowen's team also contributed. A full 8-volume, double-elephant folio version is on public display in the Audubon Room at the Harlan Hatcher Graduate Library at the University of Michigan, Ann Arbor. This, the first book purchased by the University, was bought in 1839 for $970 (equivalent to $80,000 in 2018), at the time an amazing sum. The entire volume of 435 plates is also available for viewing online at the University of Michigan's website. Since 1992, the Louisiana State University Libraries have hosted "Audubon Day," a semi-annual public showing of all four volumes of LSU's copy of the Birds of America. The set formerly belonged to one of the original subscribers, the Duke of Northumberland, and was purchased with a grant from the Crown Zellerbach Corporation in 1964. In recent years, the event has drawn more than 200 visitors. It was profiled in a 2011 Wall Street Journal article titled "The Joys of Slow Looking." In 2003, the University of Pittsburgh, which owns a complete collection of Birds of America that had been recently restored and preserved by the Etherington Conservation Center, mounted a major exhibition of 62 selected plates and other materials in its University Art Gallery. Following this, the university constructed an exhibit case on the ground floor of the school's Hillman Library to continuously display a rotating selection of plates to the public. Single plates have been exhibited for two weeks at a time in plate number order. In 2007, the university undertook a project to digitize every plate from Birds of America, as well as Audubon's Ornithological Biography, and, for the first time, presented the complete set for public viewing through one site on the internet. This event, called "Audubon day" was first conducted in 2011. In 2007 the book was the subject of an exhibition by the Teylers Museum in Haarlem, which owns a copy it ordered from the original subscription. To commemorate the book's record-breaking sale, the museum decided to display its copy (for which the museum eventually paid 2200 guilders—a fortune at the time—during the years 1827–1838) until January 2011. All of Audubon's and Mason's known extant watercolors preparatory for Birds of America are housed at the New-York Historical Society in New York City. The Stark Museum of Art in Orange, Texas, owns and exhibits John James Audubon's personal copy of Birds of America. In 2010 the North Carolina Museum of Art began a five-year exhibition of its restored four-volume set purchased for the state by Governor William Alexander Graham in 1846. Liverpool Central Library currently has a copy of Birds of America on display in a glass case, with its pages turned weekly, as well as being displayed through an interactive kiosk, allowing readers to view the contents close-up without damaging the original copy using an Evoke Ev5 Kiosk. One of the original books was bought by Laurance Spelman Rockefeller, who had each plate individually framed. They are all hanging throughout the public areas of the Woodstock Inn, in Woodstock, Vermont, which he built in 1969. Paisley Museum and Art Gallery, in Paisley, Scotland, has the four volume elephant folio of Birds of America. The Royal College of Physicians and Surgeons in Glasgow, Scotland holds one volume which is on display in the library, together with an interactive version. Though individual prints are commonly available, only one hundred twenty complete sets are known to exist. One complete copy of The Birds of America exists as part of The Darlington Collection at the University of Pittsburgh. Another complete collection is housed with Meisei University in Tokyo, Japan. The Birds of America is on permanent display in Trinity College's Watkinson Library, and was owned by the engraver, Robert Havell. It was donated to the College in 1900 by Gurdon Wadsworth Russell, an 1834 graduate of Trinity. Toronto Public Library also holds a copy; originally a four-volume set, it was unbound to preserve the individual plates which have been digitized in the library’s Digital Archive and stored in custom-made boxes in the Toronto Reference Library. Another complete copy of the prints, bound in 17 volumes, belongs to the Library of Parliament in Ottawa, Canada. Union College in Schenectady, NY possesses a complete copy that was purchased by its president Eliphalet Nott in 1844. In March 2000 Sheikh Saud Al-Thani of Qatar purchased a copy of The Birds of America at a Christie's auction for $8.8 million, a record for any book at auction. In December 2010, The Economist magazine estimated that, adjusted for inflation, five of the ten highest prices ever paid for printed books were paid for copies of The Birds of America. Of the 120 copies known to survive, only thirteen are held in private collections. In March 2000 the Fox-Bute copy sold at Christie's, New York, for $8,802,500. In December 2005 an unbound copy, the Providence Athenaeum Set, sold, again at Christie's, New York, for $5.6 million. On 6 December 2010, a complete copy of the first edition was sold in London at Sotheby's for £7,321,250 (approximately $11.5 million) during the sale of Magnificent Books, Manuscripts and Drawings from the Collection of Frederick, Second Lord Hesketh. The winning bid was a record auction price for a printed book and was placed by London-based art dealer Michael Tollemache, who outbid three others during the auction. According to the provenance details reported by the auction house, the copy's original owner was Henry Witham of Durham, listed as subscriber 11 in Audubon's Ornithological Biography; the first volume of the set bears a presentation inscription from Witham's wife, dated 24 June 1831. Lord Hesketh had bought the copy from a descendant of Witham at a Christie's auction on 3 July 1951, paying £7,000. On 20 January 2012 a complete copy of the first edition was sold by heirs of the Fourth Duke of Portland at Christie's, New York, for $7.9 million. The buyer was identified only as "an American collector who bid by phone." The sale brought to 120 the number of copies known to have survived – 107 in institution collections and 13 in private hands. Gallery of the rest of the plates. In 1830s, immediately after the publication, several plates were used as a basis for the design of a series of roller-printed furnishing fabric, produced in Lancashire, United Kingdom. ^ a b c d e f "The birds of America; from original drawings". Library of Congress. Retrieved 10 December 2010. ^ Mearns, B. & R. John Kirk Townsend: Collector of Audubon’s Western Birds and Mammals (2007). ^ Society, National Audubon. "Birds Extincted since Audubon's time". web4.audubon.org. ^ a b c Hoover, Bob (4 March 2008). 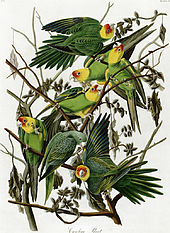 "Audubon's 'Birds' now in flock on one Web site". Pittsburgh Post-Gazette. Pittsburgh, PA. Retrieved 22 August 2011. ^ Burt, DeVere. "The Joseph Mason Project, Historic Spring Grove Cemetery and Arboretum" Archived 22 December 2015 at the Wayback Machine. Ruthven.com website. Accessed 17 December 2015. ^ "Blast From the Past: Everyone Needs a Good Assistant". History Detectives. 8 March 2013. Retrieved 27 November 2017. ^ a b c d "Audubon at Pitt". University Library System, University of Pittsburgh. 2008. Retrieved 22 August 2011. ^ "Audubon's Birds of America". digital2.library.pitt.edu. Retrieved 27 November 2017. ^ a b c "Central Park's Winged Tenants, By Audubon". The New York Times. 26 December 2003. ^ "1838 dollars in 2015 | Inflation Calculator". www.in2013dollars.com. Retrieved 27 November 2017. ^ "Audubon and men of influence". ^ a b "Victoria Gallery & Museum". liv.ac.uk. University of Liverpool. ^ a b c d "Original Audubon Prints - Antique Natural History Prints - Books - Havell - Bien - Imperial Folio - Bird and Animal Prints". minniesland.com. Archived from the original on 19 June 2010. ^ Rhodes, 2004, pp. 273, 389. ^ a b c d "Rarae Aves: Audubon At Auction". The New York Times. 3 March 2000. ^ "Vibrant Birds Of America, Via Germany". The New York Times. 25 June 2004. ^ "The Registry Of Nature Habitats - Audubon Birds of America - Publisher's Preface". abirdshome.com. ^ Flynn, Ron. "The Bien Edition / The Project, Quality, Errors and Market Value". Retrieved 30 September 2012. ^ "Audubon Galleries Original Audubon Books and Prints". Audubongalleries.com. Retrieved 10 December 2010. ^ Ron Flynn. "About Audubon and His Octavo Edition Prints". Auduboninfo.net. Retrieved 10 December 2010. ^ "PictureIt Rare Book Reader". umich.edu. ^ Willard Spiegelman (19 May 2011). "Birds of America by John James Audubon at Hill Memorial Library at Louisiana State University-The Joys of Slow Looking". Wall Street Journal. ^ "Audubon's Birds of America". pitt.edu. ^ "Free Audubon Day includes prints, lectures". Pittsburgh Post-Gazette. Retrieved 29 November 2017. ^ "Pitt's University Library System Hosts Second Annual Audubon Day". www.news.pitt.edu. University of Pittsburgh News. Retrieved 29 November 2017. ^ "Birders flock to Audubon's art - The Pitt News". The Pitt News. 2 November 2015. Retrieved 29 November 2017. ^ "Teyler's 2007 exhibition website". Vogelsxxl.nl. 3 November 2007. Retrieved 10 December 2010. ^ "Original Audubon Prints - Antique Natural History Prints - Books - Havell - Bien - Imperial Folio - Bird and Animal Prints". minniesland.com. Archived from the original on 11 November 2010. ^ "Rekindling Liverpool Central Library". Sevenstreets.com. Retrieved 24 January 2013. ^ "The book and the kiosk". evoke-kiosks.co.uk. ^ "Prize possessions on show at Paisley museum". dailyrecord. Retrieved 3 December 2015. ^ "Doors Open Day 2015". College Library. Retrieved 3 December 2015. ^ a b "Audubon's Birds of America at the University of Pittsburgh". audubon.pitt.edu. Retrieved 27 November 2017. ^ Pitz, Marylynne (16 November 2013). "Pitt exhibits Audubon prints". Pittsburgh Post Gazette. Retrieved 27 November 2017. ^ "Meisei University Birds Of America, Meisei University". birdsofamerica.meisei-u.ac.jp. Retrieved 27 November 2017. ^ Webmaster. "Trinity College is Nest for Birders". www.trincoll.edu. Retrieved 1 October 2016. ^ "Birds of America at the Toronto Public Library · John J. Audubon's Birds of America · TPL Virtual Exhibits". omeka.tplcs.ca. Retrieved 2018-06-11. ^ "Library of Parliament digitized John James Audubon bird masterpiece | CBC News". CBC. Retrieved 2018-10-26. ^ "Audubon Collection". Union College Schaeffer Library. Retrieved 2 April 2016. 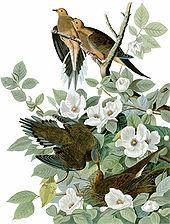 ^ "John James Audubon's 'Birds Of America' Sells for $8.8 Million". Art & Antiques Magazine. ^ "Book value". The Economist. 8 December 2010. ^ Collett, Mike. "Rare 'Birds of America' book fetches $11.5M at auction". Today.msnbc.msn.com. Retrieved 10 December 2010. ^ a b "Shakespeare first edition breaks Sotheby's record with £2.8m salet". The Independent. ^ Ellen Gamerman (26 November 2010). "Collectors Circle as 'Birds of America' Comes to Auction at Sotheby's". Wall Street Journal. ^ a b c "Lot 50: The Birds of America; from original drawings by John James Audubon. London: published by the author, 1827–1838". Sotheby's. Retrieved 10 December 2010. ^ a b Reyburn, Scott (7 December 2010). "'Birds of America' Book Fetches Record $11.5 Million". Bloomberg. ^ "Audubon's 'Birds' sells for $7.9M". New York Daily News. Associated Press. 20 January 2012. Retrieved 1 May 2012. ^ "Furnishing fabric, Lancashire, 1830s, Victoria and Albert Museum, CIRC.305-1956". Retrieved 23 February 2012. Wikimedia Commons has media related to The Birds of America. Birds of America at the University of Pittsburgh — with high resolution images of all 435 double elephant folios. Meisei University: Birds of America — the complete sets of 435 plates of drawings, with the accompanying five volumes of textbooks.